Few NJR initiatives have more potential impact or profound reach than our education programs, which encourage academic excellence and performance. In partnership with those who share our hopes of building a promising future for today’s youth through lifelong education, we aim to stimulate learning, increase motivation and open a world of opportunities beyond school years. 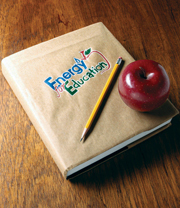 For more information on one of our Energy for Education program, please contact us at 732-938-1035 or speakers@njng.com with your request. Browse fun games and valuable information that can open your child's mind to the idea of energy conservation. NJNG is proud to sponsor the Energy Hog, a nationwide energy-efficiency campaign launched by the Alliance to Save Energy and the Ad Council. The Energy Hog makes learning about energy fun, while empowering children to make wise energy choices. In partnership with Big Brothers Big Sisters, our Project Venture mentoring program lets students experience the business world firsthand. NJNG employees mentor students from Asbury Park and Lakewood middle schools. Students gain valuable insights enabling them to build a solid foundation for their future careers. At NJNG our doors are open to you. Our Corporate Visit program is designed to familiarize participants with the various career paths the utility industry has to offer. Groups observe NJNG employees in action and gain firsthand knowledge about a variety of job opportunities in the energy field. Tailored to any grade level or group, it’s perfect for students, scouts and organizations looking for a unique glimpse at our business. NJNG is proud to help bring Achieve 3000's internet-based learning tools to students throughout our service territory. The suite of products are tailored to build reading, writing and technology skills. Fun-filled contests, polls and after-school games keep students motivated and engaged. Students sign on whenever there's an opportunity — in the classroom, library, computer lab or at home. Parents can log on to see what their children are learning and teachers can view a variety of reports to track their students' progress. As a resource for parents and soon-to-be college students, these NJNG-sponsored FREE workshops help navigate the complex college admissions process. The interactive sessions, led by experts in the field, uncover the secrets and strategies of the college planning process. Reading is fundamental to the development of children, sparking their imagination and creativity. That’s why NJNG partners with local libraries in the Share-A-Story program, which takes donated books and puts them in the hands of children who need them most. Also, by supporting Read Across America, NJNG helps children understand the importance of literacy and shares with them the joys of reading. Held annually each May at Island Beach State Park and Sandy Hook, Ocean Fun Days allows participants to explore the wonders of state's shoreline with local scientists, researchers and environmentalists. This two-day event of FREE family fun includes hands-on marine and environmental programs, exhibits, eco-tours and activities about the beaches and bays of New Jersey. Through these, and many other initiatives, we're helping to expand educational opportunities in our communities. Education opens the door to a successful career and personal fulfillment that lasts a lifetime.